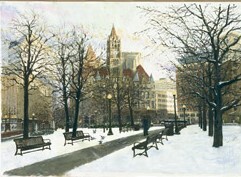 These dreamlike images (gouache paints used with brush & airbrush) feature (left) a Minneapolis sunrise with the contemporary skyline rising above trees and mist. A crescent moon hangs just above the horizon line. During the minutes just before sunset (right) Minnesota’s Capitol City is surrounded by mist. Atop Mississippi River bluffs the downtown skyline raises, in the background are the Cathedral of St. Paul and Capitol Building.